This last weekend, we were at a friend's house. As is usual, when everyone is unusually mellow, the talk turned to a discussion of the latest films, and songs. And then one of us wanted us to listen to a Coke Studio recording of a woman who sang her version of Dil cheez kya hai. It wasn't the traditional rendering, but, my god! the woman could sing! I mentioned that my favourite song from Umrao Jaan was Ye kya jageh hai doston, which I thought was the best song in the film. (I must say, though, that I like every song from Umrao Jaan.) It is a song that never fails to move me to tears. That made me think of the music director of the film who, despite having given such a stellar score for this film (and for others), had not really got his due from the industry. Part of it is his own doing - Khayyam's abject refusal to countenance any film that would compromise his ideals or principles. It was a decision he would stick to throughout his career that spanned more than six decades, with long stretches in between where he did not compose for films at all. In all, he composed for 54 films (and 17 other unreleased ones) and totalled up 626 songs (including those for TV serials and other non-film albums including those for Begum Akhtar and Mohammed Rafi). The statistics could be wrong, since we, as a nation, aren't very good at keeping records. Besides, statistics never reveal the real story anyway. And the devil is in the details. Mohammed Zahur Khayyam Hashmi, born on 18th February 1927, had always been interested in music and films. So much so, the tale goes, he ran away to Delhi. (He claims, in an interview, that his folks threw him out of the house.) While staying at his uncle's, he met music directors Husnlal-Bhagatram, who were in Delhi at the time. They were kind to the young lad, and told him that if he was serious about making it in films, he should learn music as well. This began his initial classical training - under Husnlal-Bhagatram, and sometimes under Pandit Amarnath, their elder brother. At the end of five years, Pandit Amarnath told him that if his ambition was to be in films, he should make his way to Bombay or Lahore. And so the 15-year-old Khayyam landed in Bombay. After knocking unsuccessfully on several doors - he was neither child, nor adult and there weren't many roles for a teenager - he made his way to Lahore in search of roles. Here, he had a fortuitous meeting with Ghulam Ahmed Chishti, a famous music director of Lahore, better known as Chishti Baba. Impressed by the lad's musical talent, he offered him an assistantship. Khayyam snapped up the offer, working and learning, but his destiny lay in India, more particularly in Bombay, where he made his way after the Second World War. (Khayyam had a three-year stint in the British army.) Once in Bombay, he began assisting Husnlal-Bhagatram, his mentors. In 1948, he was offered the chance to score music for a film titled Heer Ranjha. Along with Rehman Hussain, they composed the 12 songs of the film under the name Sharmaji-Varmaji. (Apparently, he was told that his name was too long for that of a music director.) Then, when his co-composer moved to Pakistan after the Partition, he continued to compose music as Sharmaji (Parda , Biwi [1950, in collaboration with Aziz Hindi], and Pyar ki Baatein [1951, where he shared honours with Bulo C Rani]. According to Khayyam, Akele mein woh ghabrate toh honge , the Mohammed Rafi solo from Biwi, was his first big 'hit'. This was followed by Footpath (1953), directed by Zia Sarhadi, who felt that 'Khayyam' had a nice distinctive ring to it. The time had come to reclaim his name. Success was doubly sweet - the film's score was Khayyam's biggest success to date (even though the film itself only saw a moderate run), and that, under his own name. In an interview, Khayyam narrates how the film's producer was so pleased with him that he proudly introduced him to all and sundry as 'my Naushad'. Strangely enough, in those days, Khayyam did not capitalise on his success. He composed for only one film the next year, and then there is a break of about four years before his next film - Shola aur Shabnam. It is a pattern that is to recur frequently in his career graph. His marriage to singer Jagjit Kaur solidified his decision to work only on his own terms. She was equally principled, insisting that he not recommend her name to producers who came to sign him on as composer. She would sing only for those composers who wanted her to sing for them. 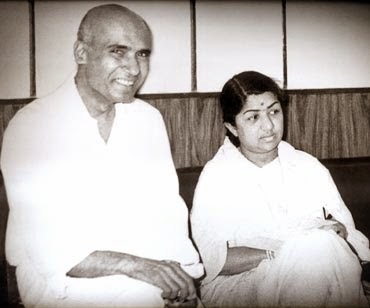 They were well-suited, he and she, and continued to make non-film albums (he composed the music for Meena Kumari's recitation of her own poems, an album titled I write, I recite); she assisted him with his music, and he firmly believes that she is responsible for who he is today. Why do I like this song so much? I cannot explain it - other than to say it's a combination of Asha's voice, Shahryar's lyrics, and Khayyam's music. There is something very haunting about the tune, and its rendition. Khayyam was initially afraid of taking on the film because before him lay the huge magnum opus that was Kamal Amrohi's Pakeezah. How could he even begin to compete with Ghulam Mohammed's score for that film? But he had read the book on which the film was based, and decided to take on the challenge. But that was only the first hurdle. The next step was to get Asha Bhosle to sing the songs. She agreed, but was shocked when the music director informed her, 'Humein 'Asha' nahin chahiye.' He explained that he wanted 'Umrao Jaan' instead. She asked him to record the song for her - the way he wanted her to sing - in his voice. According to Khayyam, she was so dedicated that she asked him to give her eight days to rehearse - she needed that time to give him 'Umrao Jaan'. 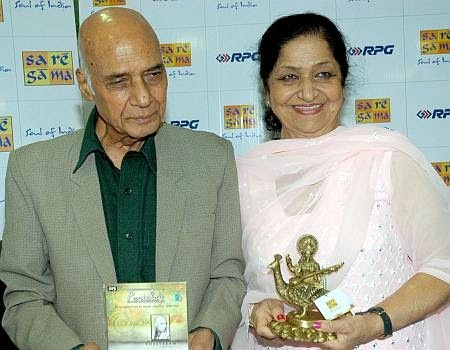 But at the recording, when she realised that the notes were set at a lower octave than usual, she asked Jagjit Kaur whether Khayyam was taking revenge on her for some past misdemeanour. She almost refused to sing. But the music director prevailed, promising her that he would also record the song in her usual voice, if she wasn't happy with the way she sounded. When she heard the recordings, she was astounded at how different - and beautiful - her voice sounded. The film won her the National Award for Best Playback Singer (Female) for Dil cheez kya hai that year, while Khayyam picked up the National Award for Best Music Director for the score. Umrao Jaan also saw the debut of ghazal-singer Talat Aziz as a playback singer for Hindi films. This was Khayyam's proud 'debut' as Khayyam. In an interview (available on YouTube if anyone cares to listen), Khayyam mentions a very interesting factoid about this song (and the others in the film). Usually, if a film has two lyricists (or two music directors), they tend to split the score, working on different songs/compositions. In Footpath, however, Majrooh Sultanpuri and Ali Sardar Jaffrey worked in collaboration on all the songs. This is one of Khayyam's most lovingly orchestrated songs. Starting with the initial notes on the electric organ followed by the piano and guitar, and then a short expressive piece on the strings, the instrumental piece ends with three notes on the guitar before Talat begins singing. The guitar sets the 3/4 rhythm, the strings come in for a brief interlude and Talat moves into the antara, the second line dropping deeper but not resolving to the tonic; then, the guitar plays a short piece after which he climbs higher again, and finally it resolves to where it started. The second interlude has lovely muted trumpet holding a short dialogue with what sounds like a flute before the second antara commences. The love ballad, expressing all the sorrowful yearning of a man waiting for his beloved, rendered by Talat Mahmood and picturised on Dilip Kumar, was a huge success, and paved the way for Khayyam to become a force to be reckoned with. (She, of course, gets no choice in the matter.) Kaifi Azmi's lines were immortalised by Khayyam's music and Mohammed Rafi's warm, mellow voice. One of Chetan Anand's lesser known films, Aakhri Khat saw the debut of the man who went on to become the first 'superstar' of Hindi films - Rajesh Khanna. This song is much more explicit than the others I have listed so far, in that the lyrics and the picturisation make it very clear that they have just made love. He doesn't want her to leave yet - Raat ab baaki hai - and he hasn't had his fill - Paake tujhko tujhe paane ki hawas baaki hai. He doesn't shy away from lust (though it embarrasses him too, a little bit) either. This song's success, for me at least, is as much because of Mohammed Rafi's quiet, sensuous rendition as it is for Khayyam's music - who complements whom? Where does one stop and the other begin? I don't know. All I know is that this song is one of the most romantic songs I've ever heard. According to Khayyam, there were 4000ft of dialogues, and 8000ft of silence. Chetan Anand's brief was that the silences were part of the story and could only be understood through the music, and Khayyam rose to the occasion - he scored the background music for the film, giving voice to the silences. Why have I chosen two songs from the same film? Because I love Aur kuch der thehar and just couldn't drop it from my list. (Bahaaron mera jeevan sawaaro is also among my favourites, but it is probably the best known song from this film.) But I came across Ye rut jawan jawan only recently, and was struck by both music and picturisation. I love the way the music leads you into this song, almost 'voicing' the words - listen to Ye rut jawan jawan... for example - you'll automatically verbalise a third 'jawan' along with the music that is being played. Bhupinder's rendition is flawless, and he was one of the finest guitarists in the industry at the time, so he was actually playing the chords on screen, instead of just holding the guitar as an accessory. Thirdly, I love that the song, picturised in a nightclub, continues in the background while the man (Manavendra Chitnis) and woman (Naqi Jahan) are speaking. Their conversation comes in between the antaras while the interludes recede into the background when they speak, and then swell into the foreground when the dialogues stop. It is all very realistic. Ye rut jawan jawan song begins in A flat, not a key normally favoured by composers. And though Bhupinder is shown playing an acoustic guitar on screen, there are simple, lovely lead melodies played on an electric guitar throughout the song. Perhaps he played those as well. There are also some great swirling trumpet solos, played with great vibrato, by Chic Chocolate himself. This is one of the first songs recorded by Jagjit Kaur in Hindi. (She had earlier sung for a Punjabi film called Posti, for Ghulam Mohammed in Dil-e-Nadaan, and for Khayyam himself in Shola aur Shabnam.) Khayyam chose an unusual accompaniment for the ghazal. This is not a standard Khayyam composition. There is a lot of piano - the melody first begins with the piano, and then it moves into an accompanists' 3-beat rhythm complete with lovely arpeggios. These interludes, though short, have nice string passages with the piano playing above them. The antara gives way to the mukhda's melody but does not repeat the latter's verses. There is a particularly lovely piano in the second interlude at 2:11, with a light touch of dissonance. The mukhda is repeated only at the end of the song. This is another of the films for which Khayyam composed the music where I have difficulty in choosing one song over the other - I like all of them, from the cynical Cheen-o-Arab hamara to the hopeful Woh subah kabhi toh aayegi, from the satirical Aasman pe hain khuda to the humorous Rafi solo, Jis pyaar mein ye haal ho. It is because of Sahir Ludhianvi that Khayyam was even considered for Phir Subah Hogi, because the former insisted that only a composer who had read - and understood - Crime and Punishment could compose for an adaption of that film. He's the one who recommended Khayyam's name to Ramesh Saigal, the director. 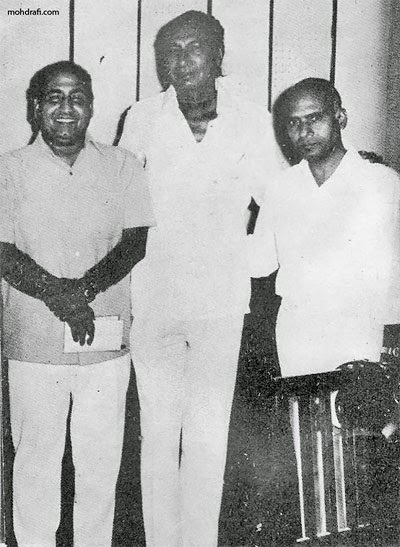 Khayyam's first face-to-face meeting with the poet had been during the making of Lala Rukh (1958), when Sahir Ludhianvi and Jaan Nissar Akhtar had dropped in on the recordings. The young music director confessed to the poet that not only had he read Sahir's Talkhiyaan, but had also set every single nazm, ghazal, and geet in it to music. As he played one of the nazms (Fankar) that he had set to music for Sahir, the gratified poet promised him that they would work together. Soon. And they did. Khayyam had to cross one hurdle though - Raj Kapoor usually worked with Shankar-Jaikishen. He was told that he had to audition for the job; would he impress the actor-director enough? Khayyam composed five tunes on the spot; Kapoor listened silently, and then, equally silently walked out of the room. He and director Ramesh Saigal didn't come back for a while. To hear Khayyam narrate the story, Raj Kapoor was so pleased with the tunes he composed that he confessed he couldn't choose one tune over the others. Khayyam should use all five tunes in the film. He could compose what he wanted to, and choose the tune he thought best. Khayyam had worked earlier with Kamal Amrohi, but this time, he was stepping in for Laxmikant-Pyarelal who had been the director's original choice. This was his first 'period film', and Khayyam confesses that he was slightly nervous about the project. So he quietly read up all he could about Razia Sultana and the Slave Dynasty. Once he discovered the Turkish origins of the originators of the Delhi Sultanate, he decided to incorporate those sounds into the music. It might seem strange that I like this song for its silences as much as for its music and for Lata's rendition, which is beautiful, as for the way Khayyam incorporated those silences into the song - they are long pauses, lasting almost 5 seconds each. The first is at the very beginning after the first line - Ae dil-e-nadaan. The long pause after, allows Razia (Hema) to pay attention to her inner turmoil. The next set of pauses come quicky, and deliberately, one after the other: Zindagi jaise khoyi khoyi hai hairan hairan hai... (long pause) Ye zameen chhup hai... (longer pause) Aasman chhup hai... now the silence is broken by the thrum of the rabab (?). And then, the instrument segues into Phir ye dhadkan si... which is exactly what the instrument sounded like. Ae dil-e-nadaan was recorded in 1976, though the film would only release in 1983. So impressed was Amitabh Bachchan when he heard the song that he sent wife Jaya to borrow the tapes from Khayyam. (She visited the composer's house at midnight, with actress Shammi in tow.) Unfortunately, the tapes were with Kamal Amrohi, but Khayyam delivered a copy to the Bachchans the next day. Amitabh recommended his name to Yash Chopra. As Khayyam narrates it, he came home the next evening to find Yash Chopra and Sahir Ludhianvi in earnest conversation with his wife, Jagjit. Chopra was readying a film on a poet, and had come to ask Khayyam to compose the score for that film - Kabhi Kabhie. It is one of the coincidences in life that Khayyam, who'd initially set Sahir's entire Talkhiyan to music for his own pleasure, was now setting music to a couple of the nazms from the book for this film. (Sahir dropped three of the stanzas from his original nazm and changed a couple of lines as well.) Khayyam remains indebted to Yash Chopra for one thing: he claims that it was Chopra who brought 'jubilees' into his career. He was successful before, yes, but none of the films he had composed for had seen the sort of success that Kabhi Kabhie and Trishul did. It is also ironical that he should win his first Filmfare award for Kabhi Kabhie, when he had given far better scores earlier. But I like Main pal do pal ka shaayar hoon, and the different versions of the titles songs much more than I like the songs picturised on Rishi Kapoor (though they are quite nice - just not 'Khayyam-ish'), and I have an unreasonable dislike of Mere ghar aayi ik nanhi pari. A couple of years later, he would once again team up with Yash Chopra and Sahir Ludhianvi for Trishul, another box-office success. An obscure film that met the fate it deserved, though it did give us Kanwaljeet, who made his mark later in television serials, and an actress named Madhuchanda, who looks astonishingly like a young Mala Sinha. She seems to have vanished into obscurity as well. Khayyam gave some incredible tunes for this film (Lata's Aap yun faaslon se guzarte rahe is absolutely wonderful, and she did choose it as one of her favourite Khayyam numbers, along with Baharon mera jeevan bhi sawaaron and Ae dil-e-nadaan) which, though it was a Kamal Amrohi production, was not worthy of his baton. But the song, the song! (As I've often said of other songs from obscure films.) Mohammed Rafi at his slow, romantic best. It is one of those songs that make you want to fall in love. Once again, Khayyam reinvented himself, sounding more like OP Nayyar with the taar shehnai and the guitar in the interludes. The taar shehnai is there right through the verses but the changes are more visible in the singing and in the rhythm and melody from the interludes to the vocals. You'll also see how the music changes leading into the antara because the antaras are more introspective, whereas the mukhda is more joyous. The mukhda alternates between the C major and its associated A minor key but the antara starts with an E major chord. It is an odd progression. This was one of Shashi Kapoor's earlier films, when the only heroine who would agree to act with him, whether their previous film flopped or not, was Nanda. They look very comfortable together, though I must confess that I've never been able to see Nanda as a romantic heroine. She looked like everyone's favourite sister. Mohammed Rafi does what he does best - be laughingly, flirtatiously, playfully romantic. Suman Kalyanpur was making hay while the sun shone, since Lata Mangeshkar had stopped working with Rafi. She stepped up to the challenge and succeeded in forming a good partnership with Mohammed Rafi, and making a name for herself. Talat Mahmood had been bitten by the acting bug, and this was one of his early forays into being onscreen instead of off it. He plays the romantic hero here, a prince who turns into a pauper to see if his betrothed actually loves him or his kingdom. While he (obviously) sang his own songs, music director Khayyam brought in Mohammed Rafi to sing this lilting ballad. He talked about how he decided to make the song 'not quite' technically perfect, and composed accordingly. It was picturised on Lotan (and Radhika, who is apparently actress Kumkum's younger sister - I would be grateful if someone could confirm that), who plays a happy-go-lucky man who befriends the prince. Lala Rukh was produced by writer Ismat Chughtai and her husband Shahid Latif, and Khayyam narrates how the former wasn't too happy with the lyrics that Kaifi Azmi originally wrote originally for the song. She said they were too 'kitaabi', too much of 'shaayari', and they were making a film. When Khayyam told her that he liked the lyrics, she responded, 'Khud toh bhooko mar rahe ho aur humein bhi bhooko maaroge?' But he persisted, and composed the tunes for Hai kali kali ke lab par and Pyaas kuch aur bhi bhadkaa di initially. He had told her that if she didn't like it, they would change both lyrics and melody. They didn't have to. These are just a handful of the songs he composed, and so well, giving them his all even when the films didn't demand, or deserve, his fine tunes. Fame and success didn't bring arrogance in its train, the simple composer remaining happy with what he's achieved so far. He has no regrets, and no complaints, even though he confesses that present-day lyrics leave him cold. He is animated when he talks about the talent and dedication of all the artistes he's had the honour of working with, and it appears that he likes everybody and everybody liked him. The still-unassuming composer, who is quick to give equal credit to the lyricist and the singer for the success of a song, lives a quiet and contented life with his wife, though the shadow of the untimely death of their only son, Pradeep, is never too far away from his thoughts. Here's wishing him many more healthy, contented years. What are your favourite Khayyam compositions? A very nice write-up as usual. Any article on Khayyam Saab's compositions is incomplete without at least a mention of his private non-filmi Gazals and Bhajans sung by Rafi Saab. Unusually, there is a need for a little proofreading. And you may check this :" Khayyam's stellar score that included the beautiful Mohammed-Rafi-Lata Mangeshkar duet Parbaton ke pedon par." Lovely list, Anu - and that background about Khayyam made for very interesting reading. He happens to be one of my favourite of the more underrated MDs - it's sad that few people these days tend to remember Khayyam. :-( I like the fact that you picked Rut jawaan-jawaan, because that gets overlooked so often when talking of Khayyam's oeuvre - oh, and I love Shaam-e-gham ki kasam and nearly all the songs from Phir Subah Hogi (though if I were making a Khayyam list, I'd probably have picked Woh subah kabhi toh aayegi). Lovely list, Anu and so much interesting information. Khayyam is such a modest and unassuming gentleman, pity that he is so underrated... I like the songs of Phir Subah Hogi very much and besides that, love Sham-e-gham ki kasam and Thehriye Hosh mein aa loon and Main pal do pal ka. It is funny, but the one Khayyam song I have never liked is Ae dil-e-nadaan. Do not know why! Thank you, Shyam. Thank you for catching that - I thought it was Lata, and didn't double check. Thank you, Madhu, the sad thing is when people talk about Khayaam, they only talk about kabhi Kabhie, Trishul and Umrao Jaan. :( I came across Rut jawan jawan only recently - and am kicking myself for not having heard it before. Thank you, Harini. I think a part of why he is underrated is because he didn't work that much. If you looked at his filmography, even when he started out, he seems to have done one film a year. And there have been inexplicable gaps of four years, seven years, nine years, etc., in these five or six decades. I'm sorry to hear about the RSS feed; I will look into it. Would you do me one favour, though? Could you delete it, and subscribe to it again? I don't know where the issue is, so we might as well try both. Without doubt, Parbaton ke pedo par, shaam ka basera hai. these are the songs that spring to my mind immediately. You list covers most of my favorites, really. He has also composed so many gair filmi ones that you could make a separate list out of those! You just made my day, Anu. My all time favourite composer. Your list read like my mind. I too like the "ye kyaa jagah hai dosto" from Umrao Jaan the best. I wondered if she likes "phir na keeje" it was there, though sometimes I like cheeno Arab humara and love the words of " aasman pe hai khuda". While reading and listening to "aur kuch der theher", was thinking, what about the "rut jawan, jawan, jawan" it was there. "Ae dil-e-nadan" was there too.... Really enjoyed the post and SSR's informative descriptions of the music and instruments. Yes, Khaiyyam does use a lot of komal swars which gives his melodies a very soft and haunting feel. I have seen a few interviews of him on youtube, have you noticed how big his hands are ? He uses them quite a bit while explaing things, and Jagjit Kaur is so unassuming. I would like to add one more to the list from Bazar, another one in Jagjit Kaur's soulful voice. "Dekh lo, aaj humko jee bhar ke"
ava, all of those are also among my favourites. :) Though I thought Dikhayi diye yun would have sounded so much better when Lata was in full form. Yes, I know he's composed a whole lot of non-film albums - especially one of Rafi singing Bhajans: This is Rafi, I think it is called. I was focusing on his film career, though. Neeru, thank you. I'm glad you enjoyed the post. I did enjoy all the interviews with Khayyam that I managed to view on YouTube. But there were some contradictions in what he says: for instance, he said he'd assisted Baba Chishti on BR Chopra's Chandni Chowk, and got his first pay cheque from Chopra - Rs 125. But Chandni Chowk's music is by Roshan, and not Baba Chishti. Secondly, the movie released in 1954, by which time Khayyam had already given music for films, so it couldn't have been his first pay cheque by any means. But he comes across as such a nice gentleman, doesn't he? I quite enjoyed his conversations, going off on tangents in between, and not a bad word to say about anyone. I did like the songs of Bazaar though I was telling Ava that I wonder how Dikhayi diye yun would have sounded if Lata had sung it when she was in her heyday. It's a sad movie. It is a sad movie indeed. I avoided it for a very long time but Jagjit Kaur's song led me to see it finally. I like sad songs but not fond of sad movies with sad endings. Contradiction in my thinking I guess. A friend once remarked that for a happy go lucky person, you sure do like sad songs. There are two songs from a film called Barood that I remember hearing once in a blue moon on the radio as a child, never in their entirety and thanks to youtube we have both songs in their completeness. I love the first one for its raw untrammelled percussion sung as accompaniments of sorts to a punjabi giddha (though there are men dancing in this one too). This is one of the more authentic songs in hindi films that I think projects the energy and grace of a giddha. The second song comes through the film at various points. Somebody has taken the pains here to splice the various pieces together. It is sung as a bhajan but interestingly there is a large element of choral church music. The chorus blends beautifully with the orchestra and with Lata's achingly pure soprano.Very un Khayyam like trumpet fanfares towards the end of the song, big strings, big sound like listening to a Mahlerian symphony. Not only is Rang rangeela a great foot tapping song, it showcases KumKum's dancing and expressions fitting the lyrics to the T.
Anu, there seems to be a Chandni Chowk made in 1946. I watched Bazaar on Doordarshan. And remember feeling very sad afterwards. And I agree with you about liking sad song, but not films with sad endings. Haven't heard either song before, but oh, the second one is really touching. The first is lovely too, absolutely foot-tapping, and the percussion isfabulous. Thanks for linking them here. Kumkum was a good dancer, and a reasonably competent actress. And yes, the song was a lovely dance number. Excellent write-up, and excellent selection. One can't go wrong with Khayyam. One song which is my great favourite is Dekho dekhoji gori sasural chali from Shagun. Bazaar deserved a place, but has been mentioned in comments. Compliments to SSW's antaraas too. A correction: Bujha diye hain is perhaps sung by Suman Kalyanpur. Thank you, AK. And I'm an idiot. I'd already made a mistake with terming Parbaton ke pedon par a Rafi-Lata duet, and was pulled up for it. For some reason, that song stuck in my head as being sung by Lata. So also Bujha diye hain. :( Thanks; I've made the correction. I noticed the above skit mention, and watched. Both my husband and myself could not finish watching the whole scene, we were laughing so hard. Thanks for the laughs. One of the Ramta songs mentions the lift and what happens when a person goes up in it and then comes down. The Lift part starts at 4.56. I wanted to mention one more song of aakhri khat. This movie had such a range of music as if Khaiyyam was experimenting with different geners of music and singers. From the soft ' baharon, mera jeewan bhi' and 'aur kuch der the her' to the club songs with a western touch. This one is in Manna Dey's voice. I could not find a visual, only an audio. Not that I like the song much, but just to mention the range of music Khaiyyam came up with. You're welcome, Nalini. I'm glad I refreshed your memory. :) Like you, I know the dialogues and words by heart. And I can watch it any time. Just a wonderful movie! :) Good one. So true, as well, no? I haven't heard this one before, Neeru. I agree with you about the song, though Manna Dey has sung it very well indeed. Lovely song. Thanks for sharing. I have a soft corner for Khayyam and for all the songs on your list. Great job. Aakhri Khat is one my favorite films where Rajesh Khanna plays his role with a lot of understatement. And as you mentioned, all the songs in the movie are wonderful. I also agree with you that 'Yeh Kya Jageh Hain Doston' is the best song in Umrao Jaan. 'Jaane Kya Dhoondti Rehti Hai' seems so easy to sing (at least the first two stanzas till one tries to sing the third and busts his lungs) but without the subtle variations that Rafi brings to the song it could become quite pedestrian. It is as much Rafi's song as Khayyam's. Thank you, Soumya. I totally agree about Jaane kya doondhti rehti hain being as much a Rafi song as Khayyam's. But that, I think, can be said about any great song. As Khayyam himself put it, a tune that he composes is great only because of the contribution of the lyricist and the singer who breathes life into it. Nice write-up, Anu on a master composer. Many of his compositions had a very peaceful, "pahadi" feel to them that I find very appealing. Btw, one correction - Shagoon wasn't Jagit Kaur's first Hindi film song. She had sung much earlier in 1953 for Ghulam Mohammed in Dil-E-Nadaan. Shagoon wasn't even her first time singing for Khayyam. She had already sung a couple of songs in Shola aur Shabnam. Incidentally, according to Khayyam it took Rafi 21 takes to get "jaane kya dhoondhti rehti hai" right. Thanks, Shalini. I didn't know Jajit Kaur had sung for Ghulam Mohammed as early as 1953. 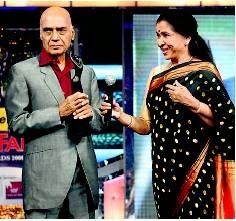 I must confess that I went by Khayyam's interview, where he said that she sang her first song in Hindi for him. I checked back, but didn't come across Dil-e-Nadaan at all. I'll correct it up there. Thanks for the other links as well - I hadn't heard this particular song from Sankalp before. Thanks, Ashraf. :) I do like Ye raat bahut rangeen sahi; a very soft Rafi, yet he spans such a range. I was just thinking back and realising that with Khayyam, I mostly seem to like the complete score in most of his films. I think a slightly different and shorter version is in the film. Both versions are wonderful. I thought of mentioning this earlier, but I realize how many songs one can incorporate in a posting. I also want to say that BR Chopra's Chandni Chowk started early and faced many problems and finally released in 1954. You may see the youtube video on BR Chopra's Biography. Shyam, I figured that Chandni Chowk may have been in the making for many years, but this seems to have seen a change of music directors as well. If the songs were already recorded, as Naushad states, then why weren't they used? Why was Roshan brought in? Thanks for the quick reply and for the opportunity, and the for the loss of opportunity (because of the self correction). I think the earlier attempts at making the film happened in Lahore/Pakistan and then , you know what happened;they must have lost those prints or recordings or whatever. They may have started afresh. This is my conjecture only. As you said many questions and hardly any answers. Khayyam has always evoked a very special preference in the list of My Likes. The irony is his popular work is so well known and not-so-popular one far more unsung - two extremes, so to say. Yes, I assume that Partition caused a problem, and of course, they couldn't get Baba Chishti again. But by 1954, Khayyam was riding high on the musical success of Footpath; and he remained grateful to BR Chopra for his first cheque. While BR had been so impressed with his work, that he paid him an unheard of amount (for those days). So I'm still wondering why Chandni Chowk in its second incarnation went to Roshan instead. Do you have a link to BR's biography? He was an interesting man to talk to. There is a brief mention of partition responsible for not completing Chandani Chowk which started in 1946 both in Wikipedia of B. R. Chopra and his biography on youtube. Why he chose Roshan,, perhaps the answer maybe buried in various articles and interviews, would be an interesting read and watch. Will post here if I find out. You bet! But just initial 10 to 15 second? Or more? Isn't Rafi amazing in both? Just wondering if B.R. Chopra ever pick Khaiyyam for his movies ? I don't think so, Neeru. He seems to have repeated N Dutta and Ravi a few times, but otherwise, has worked with different MDs each time - Salil Choudhary, Husnlal Bhagatram, Sapan Chakraborty, Laxmikant-Pyarelal, Roshan, Hemant Kumar, etc. This gives some idea about Chandni Chowk and about BR Chopra.